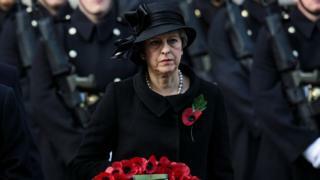 Theresa May will lay a wreath at the graves of the first and last UK soldiers killed in World War One as she travels to France and Belgium to mark the Armistice centenary. The prime minister will be joined by French President Emmanuel Macron and Belgian Prime Minister Charles Michel for the commemorations on Friday. The visits reflect a shared history and shared future, Mrs May will say. A private meeting and working lunch with Mr Macron will also take place. The prime minister’s visit will begin in Belgium’s St Symphorien Military Cemetery in Mons, where she will visit the graves of John Parr, the first UK soldier to be killed in 1914, and the last, George Ellison. He was killed on the Western Front at 09:30 GMT, before the Armistice came into effect at 11:00, 100 years ago this Sunday. Mrs May and Mr Michel will attend a reception at which they will meet British and Belgian serving members of the armed forces before she travels to France. She will meet Mr Macron in Albert, a town in the heart of the Somme region which suffered heavy bombardment during World War One. The two leaders will then hold their meeting before attending a wreath-laying ceremony at the nearby Thiepval Memorial. It commemorates more than 70,000 British and Commonwealth soldiers who died there and is a symbol of Anglo-French cooperation. A wreath combining the poppy and le bleuet (or cornflower) – the two national emblems of remembrance for Britain and France – has been made for the occasion. She said: “At St Symphorien I will have the honour of laying a wreath on behalf of a nation at the graves of both John Parr and George Ellison, the first and last UK soldiers to die during the war. The prime minister returns to the UK on Saturday for the Royal British Legion Festival of Remembrance at the Royal Albert Hall in London. She will lay a wreath at the Cenotaph on Remembrance Sunday and attend the national service to mark the centenary of the Armistice at Westminster Abbey. About 70 world leaders including US President Donald Trump, Russia’s Vladimir Putin and Germany’s Angela Merkel will take part in a ceremony on the Champs-Elysees in Paris on Sunday morning to mark the 100th anniversary of the end of World War One.